Cardamine concatenata(formerly Dentaria laciniata)holds a special place in my heart, as it is the only native herbaceous plant that grows with anything approaching exuberance in my dry, rocky woods. My first spring in Ithaca, I searched out each spot of green, hoping for the carpets of strawberries and violets I remembered from a favorite childhood home in western Pennsylvania. Didn’t happen, but enough water comes down the hill in spring to support a nice carpet of toothwort. It also persists in my garden beds, and even a bit where naturalized bulbs delay the lawn mowing. Cutleaf toothwort is a spring ephemeral, completely gone by summer. It is broadly distributed in the east half of North America - from southern Quebec to Minnesota, south to Oklahoma, Louisiana, and Florida. It grows in shade in rich moist woods and can take hardiness zones 3-8. It tolerates summer drought, so long as there is enough moisture during the aboveground period (roughly April-June). Some references state that it prefers humus-rich acid soil, but it grows well in my pH 7 soil. Cardamine concatenata is a facultative upland species (FACU), i.e. it is not usually found in wetlands, but does well in riparian areas. The white flowers are not particularly vivid and bold, but are instead charming. Their greatest beauty lies in being very early and numerous - perfect after a long winter. The leaves and rhizomes are both edible, raw or cooked. Supposedly the taste is peppery - reminiscent of horseradish. 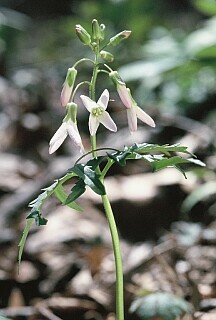 Cutleaf toothwort is a larval food for Pieris butterflies, including Pieris oleracea (mustard white) and P. virginiensis, the West Virginia white butterfly. The latter species is in decline, in part due to the spread of garlic mustard, used as an alternate, but inadequate, larval host. Identification - 3-5 in high. The leaves, arising early in the spring, are divided into 5 narrow segments with finely cut margins. There is a whorl of 3 leaves per stem, with the flower spike in the middle. Flowers are small, white or pinkish, and four-petaled. Rhizomes, just below the soil surface, are fragile and easily break into segments. I thought "toothwort" referred to the shape of the rhizome, which, with enough imagination, could look like some animal’s tooth (including the tooth root). Cullina claims it is, instead, the surface bumps or ridges on the rhizome that are supposed to suggest teeth. 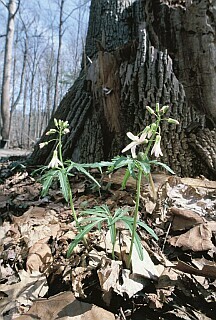 Two similar toothworts (also reclassified from Dentaria) are found in the Finger Lakes: Cardamine diphylla and C. maxima. The latter is thought to be derived from a natural hybrid of concatenata and diphylla. Cardamine maxima and C. diphylla have rhizomes that are not fragile and do not easily break into segments. The rhizomes also have larger, more distinct teeth (vs. fewer, smaller teeth for C. concatenata). Cardamine maxima usually has three leaves that are distinctly alternate (vs. whorled for C. concatenata). Cardamine diphylla has paired leaves (very nearly opposite) with only 3 segments which are wider than in C. concatenata. The leaves also have more rounded teeth. The leaves of these three Cardamines are variable, though, and may be hard to distinguish. Luckily toothworts tend to occur in large drifts, so you will have lots of leaves to consider. Cultivation - Cutleaf toothwort is easy to grow and will self-sow to form a nice patch of spring leaves. Cutleaf toothwort is reputed to spread less aggressively in garden settings than C. diphylla or C. maxima. The rhizomes are easily transplanted, and seed propagation is straightforward, requiring warm followed by cold stratification. See the links below for details. Toothworts are generally tough, but are susceptible to some diseases, leading to weak growth and blotched leaves. Many thanks to David Werier for differential identification suggestions and the proper description of toothwort’s taste! For More Information...Due to the wide distribution of cutleaf toothwort, lots of information about it is out on the web and in standard references. Here are a few places worth checking. Propagation protocol from Native Plant Network: Baskin, C. C. and Baskin, J. M. (1995). Warm plus cold stratification requirement for dormancy break in seeds of the woodland herb Cardamine concatenata (Brassicaceae), and evolutionary implications. Can. J. Bot. 73, 608-612. In: Baskin, C. and Baskin, J. Table 10.18 Chapter 10. Seeds: Ecology, Biogeography and Evolution of Dormancy and Germination. Academic Press, 1998. 666 pages. Cardamine maxima & the question of hybrids: Brittonia 53: 82-95, 2001. Cultivation & propagation: Cullina, W., NEWFS Guide to Growing and Propagating of Wildflowers of the US & Canada, Houghton Mifflin, 2000.